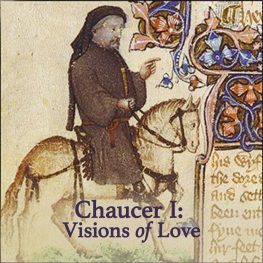 This class is the first semester in a two-part survey of Chaucer’s major works, looking at his early dream vision poems and his greatest completed work: Troilus and Criseyde. What besides The Canterbury Tales did Chaucer write? How did Chaucer engage with earlier medieval authors? This class is the first semester in a two-part survey of Chaucer’s major works. In this first semester, we will study the works with which Chaucer established his reputation in his time: his early dream vision poems and his greatest completed work: Troilus and Criseyde. In the second semester, we will study The Canterbury Tales. In this first semester, we will focus on immersing ourselves in Chaucer’s language, building not only a comprehension of Chaucer’s verse but a sensitivity to the subtle nuances of Chaucer’s tone and narrative voice. We will be reading Chaucer exclusively in Middle English, but no previous experience with Middle English is required. Chaucer delights to engage other authors and other texts through his own poems, so we will also be reading some of the works with which Chaucer is explicitly interacting, including medieval favorites such as Ovid, Cicero, Macrobius, and Chaucer’s great Italian predecessor, Boccaccio. Although not required, students are highly encouraged to take Chaucer II: The Canterbury Tales after taking this course. This course includes two 90-minute lectures per week with one 60-minute discussion session as assigned. In addition to the Riverside, I have recommended the Norton Critical edition of the Troilus. You need not purchase this if you’d rather not – the required texts contain both Chaucer’s Troilus and Boccaccio’s Il Filostrato. However, the Norton Troilus features a facing-page edition that puts Chaucer’s poem in direct parallel with Boccaccio’s work, which makes direct comparison much easier. If you decide, for instance, to write a paper on Troilus, I’d recommend picking up a copy of the Norton; it’s pretty darn cool.